Professor Sir Tejinder Virdee is a household name amongst particle physicists. He has received numerous awards for his services to science, and received a knighthood from the Queen in 2014. This year, he has been awarded the Institute of Physics’ Glazebrook Medal for his leadership of the CMS experiment at CERN. Sir Tejinder played a major role in the concept, development and construction of the experiment, and played an important part in the discovery of the Higgs boson. The discovery of the Higgs boson in July 2012 by the ATLAS and CMS experiments at the Large Hadron Collider (LHC) at CERN in Geneva is one of the great scientific and intellectual achievements of humankind. The mechanism that led to the postulation of this elusive subatomic particle, some 50 years ago, imparts mass to the fundamental building blocks of Nature. The discovery of the Higgs boson represents the coronation of the Standard Model (SM) of particle physics, a theory that describes our visible universe in exquisite detail. Hubble’s dark matter map: 95% of the energy / matter in our universe remains unexplained. However, the SM only explains about 5% of the energy/matter density of our universe. We still don’t know the composition of the other 95%, which is labelled dark matter and dark energy – because they do not “shine”. So the questions we still are asking are: What is dark matter or dark energy? Why is there more matter than antimatter in our universe? Do we live in more than 4 dimensions? Furthermore, the values of many of the parameters in the SM are taken from experimental measurements, with the hope that a unified theory of all four fundamental forces (gravitational, weak, electromagnetic and strong) would lead to their derivation from first principles. So the SM is known to be an incomplete theory of Nature. It is known that fundamental particles such as the Higgs boson get quantum corrections to their mass. These can be extremely large if the widely anticipated extensions to the SM lie at very large energy scales. A favoured conjecture at or around the LHC energy scale invokes a new symmetry, supersymmetry, which alleviates this problem by postulating the existence of new particles. The supersymmetry postulate states that for every known fundamental SM particle there exists a “super-partner” differing by a half unit of spin, thus doubling the spectrum of fundamental particles. None have been found yet – presumably they are too heavy to have been observed/discovered so far. Amongst other features is that the lowest mass state in this new set of particles could account for dark matter. Also five Higgs bosons are predicted, with one having properties quite close to those of the SM Higgs boson. Therefore there is much more still to discover and understand. 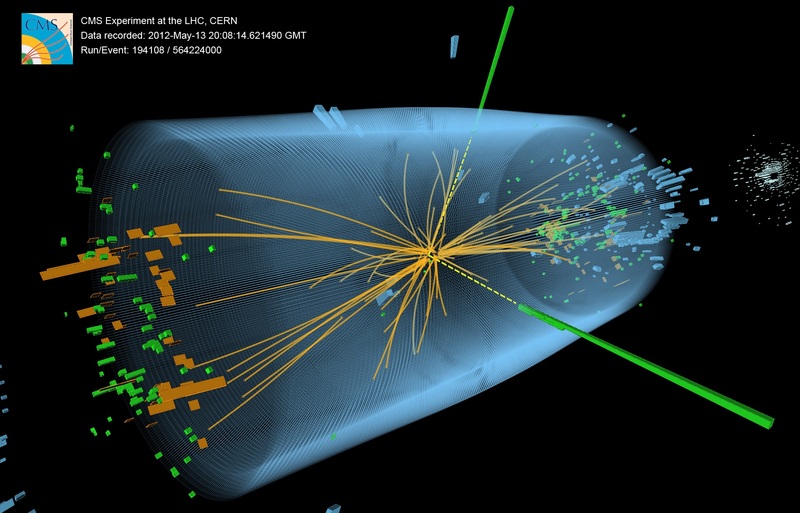 We shall be looking for new particles, and new phenomena, in the LHC run that has just started (July 2015). The proton-proton collision energy has been almost doubled (13 TeV compared with 8 TeV during the previous run). By the end of this year we shall be entering uncharted territory in particle physics. As more data accumulate there is a tantalizing possibility of discovering revolutionary new physics beyond the Standard Model. To answer the open questions in particle physics, or find clues in order to make further progress, we now aim to examine approximately 5.1017 proton-proton collisions at the LHC (a factor of 10 higher than initially planned in the 1990s). Indeed, in a recent report on the European strategy for particle physics it was stated that Europe’s top priority should be the exploitation of the full potential of the LHC, including the high-luminosity upgrade of the machine and detectors with a view to collecting ten times more data than in the initial design. With the examination of increased number of collisions we shall be looking for new heavy particles, and if found, study them in depth, as well as looking for deviations from the predictions for the production of Higgs bosons and of other well-known Standard Model processes for clues to the new physics. All in all an exciting physics exploitation programme lies ahead, over the next two decades! Some parts of the current CMS detector, that were designed in the early 1990s and built in the 2000s, will not survive the increased number of collisions foreseen in late 2020s, and hence have to be replaced or upgraded. designing, and then building, innovative and technologically more advanced replacements for those parts of the CMS experiment that need replacement. From the data accumulated during 2010-2012, we find that the measured properties of the Higgs boson are consistent, within uncertainties, with expectations for the SM Higgs boson. More data, to be taken during the next three to six years, corresponding to the collection and study of 100 times larger number of Higgs bosons, will enable a more rigorous test of this conclusion and whether the properties of the new particle imply physics beyond the standard model. be due to known SM background processes. To accomplish this we are preparing to upgrade the experiments, and the LHC accelerator, for operation around the mid-2020s, at an instantaneous rate of collisions that is 10 times higher than originally planned (5 billion interaction/sec instead of the current design 700 million/sec). I am leading a team that is developing a novel technology for the “endcap” region of CMS in order to identify and measure the energy of electrons, photons and quarks and gluons (that manifest themselves as collimated bunches of particles labelled as “jets”). This involves the use of a highly granular novel calorimeter, based on the silicon detectors, associated with powerful radiation-hard fast electronics, in an even more challenging environment than encountered so far; this has never been attempted before and if successful will alter the way energy is measured in future particle physics experiments. This somewhat parallels the situation of the early 1990s, where we had to develop and then build detectors which were radically different or entirely new compared to those that existed at the time. In the early 1990s it was not at all clear that we would succeed in building such complex experiments as CMS, but succeed we did, as exemplified by the wealth of physics results emerging from CMS, with the most significant being the discovery of the Higgs boson. Recently I was awarded a 5-year multi-million Euro European Research Council Advanced grant to develop this novel highly granular calorimeter technology. So the next five years are going to be very busy for me, and hopefully just as fulfilling as the previous phases of the experiment. My keen interest in physics came to the fore during my undergraduate years at Queen Mary College, London. For me, there wasn’t much hesitation about the area for my postgraduate studies – high-energy particle physics as it tackles the most fundamental of scientific questions. As Edward Witten, the 2010 Newton Medal winner, has put it “particle physics is a modern name for centuries old effort to understand the laws of Nature”. I got accepted at Imperial College, London and had a superb supervisor, Peter Dornan, under whose guidance I carried out the data collection and analysis for my thesis at the Stanford Linear Accelerator Centre in Stanford, California. After the discovery of the Higgs boson our field of particle physics is at crossroads. We need to identify which is the most promising path to follow – this critically needs experimental input that may well come from the LHC, hopefully through the discovery of a new phenomenon or a new particle. However, the clues can also come from other experiments in our field, both accelerator based (e.g. long baseline neutrino experiments), and/or non-accelerator experiments (e.g. searching for dark matter, neutrinoless double-beta decay), as well as from space-based experiments. What do you consider to be the hot topics in particle physics at the moment? Search for physics beyond the Standard Model of particle physics in many diverse experiments. Time permitting: skiing, photography and oil painting. When I started my PhD, in 1974, only half of the fundamental particles of the Standard Model had been discovered. The postulate of the Higgs boson was only 12 years old and the seminal works on the unification of electromagnetism with the weak interaction of Weinberg and Salam (1967), earlier work of Glashow, and of the proof of renormalisability (finiteness) of gauge theories with massive bosons of t’Hooft and Veltman (1971), were being fully digested. To see the completion of the particle content of the SM in my scientific career has been breathtaking. And it has been a privilege to be associated with the discovery of the keystone of the Standard Model, the Higgs boson. Well it happened when I was very young at around 15 at Kings Norton Grammar School for Boys in Birmingham. I had an interesting teacher who loved physics and holidays abroad, especially in Italy. School trips were often organised by Howard Stockley my physics teacher, and on one of these trips to Italy we discussed physics along with discovering the arts and history from the Roman, through Renaissance times to the present. It would be true to say that he was my first inspirational teacher. Unknown to me, Howard followed my career and sadly passed away just after the discovery of the Higgs boson, which I had communicated to him in person, a few weeks before the announcement made at CERN. His great quality was to encourage his students to ask profound questions about Nature: how does our universe work and why? Reading a scientific paper or merely making an observation of a physical phenomenon naturally leads to asking questions of how and why. So when the answer or the understanding becomes obvious, I feel a sense of great satisfaction, almost exhilaration, arising from the fact that I have finally understood something that previously I had not. I always get a kick out of understanding something new, even if it might appear to be inconsequential in the grand scheme of things. But the bigger pictures are the more revolutionary ones that we physicists are always chasing. All the time one starts by understanding the little things. My experience has taught me that almost every day, every week, I learn and understand something new, and that is what is interesting about particle physics, and science in general, it, it is motivating and immensely exciting. A curious mind with a passion to understand how Nature works, dedication, perseverance and a good work ethic are what are needed to have a successful career in the sciences. Follow your curiosity and you won’t be disappointed. The Institute of Physics in the UK is a scientific charity that works to enhance physics education, research and application. We have great opportunities through living in a society that gives us the freedom of inquiry – an essential ingredient for humans to make bountiful progress. Fundamental science is based on this freedom of inquiry and progress in fundamental science gives us a deeper understanding of how Nature works. This understanding, essentially of the fundamental laws of Nature, underpins modern life and, over the centuries, has altered very much the way we live – giving us a better life – providing us with paradigm shifting technologies, such as electricity, electronics, telecommunication, medical imaging, The World Wide Web invented at CERN just over 20 years ago, to name just a few. As Newton put it, “To me there has never been a higher source of earthly honour or distinction than that connected with advances in science”. We humans are naturally curious and have a desire to (scientifically) understand the world around us. With sufficient dedication and perseverance one can have a successful career in physics, and science in general. Whether you end up becoming a practicing scientist or not is not terribly important – what is important is that you are able to take a reasoned and evidence based position on the great issues of the day facing humankind. Evidence-based arguments form the basis of the scientific method. So I feel it is incumbent on the young to pursue science at school. For me, education in England was to give me the freedom to pursue fundamental science as a profession. My success has come in small doses by working with teams of scientists who would go on to make major scientific discoveries. But my journey into science also comes from having disappointments, resolving them, refocusing, and carrying on. This has been the pattern throughout my 40-year scientific career. My early education in Africa was essential to how I would deal with these disappointments. The first one I can remember vividly was when I was around 8 years old. My clever elder brother was scoring high in class and I wasn’t doing well at all. He always came first, and I almost last. My father rewarded him with a present for coming in first place. Unfortunately, I did badly and achieved 26th place. I cheekily asked my father for 26 presents! He was not amused, and I was disappointed with myself. From then on, I began to apply myself, and studied hard. I am always reminded of what my physics teacher used to say when teaching or during broadening-the-mind trips: “what fun”. Professor Sir Tejinder Virdee continues to be an outspoken advocate of the continued development and running of major experiments at CERN. He is writing some of his own personal perspectives on particle physics to celebrate Journal of Physics G: Nuclear and Particle Physics‘ 40th anniversary collection, due to be published later this year. Title image: courtesy of Professor Sir Tejinder Virdee. Dark matter map: NASA, ESA, M.J. Jee and H. Ford (Johns Hopkins University). Read more here. CMS experiment: from CMS Physics Technical Design Report, Volume II: Physics Performance, The CMS Collaboration 2007 J. Phys. G: Nucl. Part. Phys. 34 995. 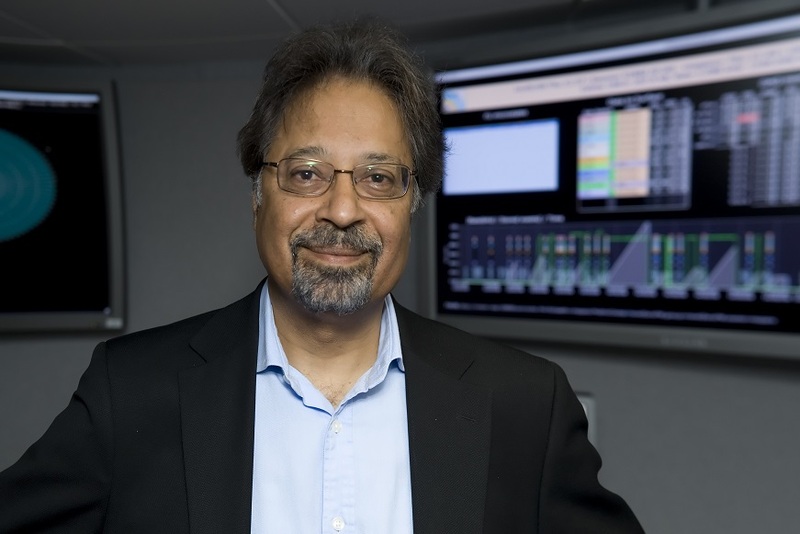 Event in the CMS detector: provided by Professor Sir Tejinder Virdee. IOP image and 40th anniversary logo: Copyright IOP and IOP Publishing, respectively.